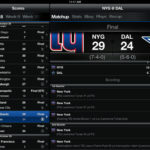 There are about three quarters of a billion active iOS and Android devices across the globe, set to generate approximately $10 billion in revenue by the end of 2012. These numbers are amazing, but which countries are driving this tremendous growth of the mobile market? Flurry has the answers. 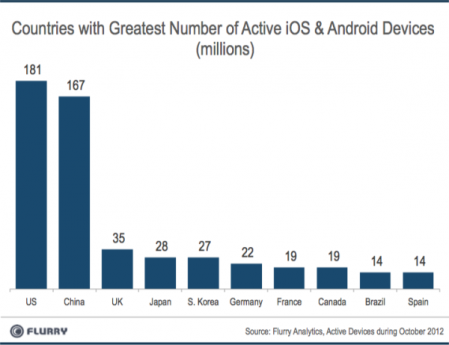 As you can see from the above chart, China and the US are way above other countries on Flurry’s top ten list of countries with the greatest number of active iOS and Android devices. If China maintains its current growth curve, it will likely surpass the US installed base by the first quarter of next year: while the US added 55 million active devices on a year-over-year basis, China has more than doubled that number with 125 million. In figures this means China recorded a whopping 293% growth rate from October 2011 to October 2012, driven by the rapidly growing middle class, Peter Farago notes. 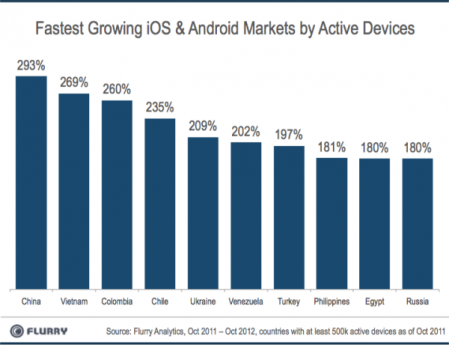 In addition, other countries such as the Philippines, Colombia, Ukraine and Venezuela have made their way into Flurry’s top ten list of fastest growing iOS and Android markets. Maybe this is the reason why application usage is now driven by the countries of the aforementioned top ten list, not the US, as it was last October. In numbers: while the US recorded 48% of the total app usage last year, it now only accounts for 29% of all app sessions while the rest takes place outside the country.